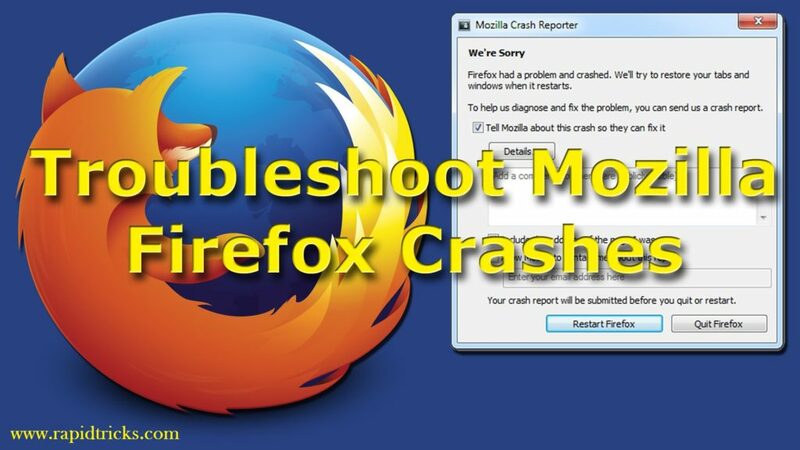 Are you facing crashing problem while using Mozilla Firefox browser? If yes, then don’t worry we have a solution for you. In this article i will guide you on “How TO Fix Mozilla Firefox Crashing Problem”. So read the article thoroughly and fix Firefox crash problem. Without any doubt Mozilla Firefox is one of the best internet browser in the cyber world, it has a lot of functions which makes it worth using for any user. It has almost all the features a user needs while surfing the internet, some useful features of Mozilla Firefox are as follows. Add on function (By which a user can add many features to Mozilla Firefox). IGnito Browsing (by which a user can surf internet without get tracked by browser history). Mozilla Firefox has a lot of features, which we are not going to discuss in this article, because we have made this article to troubleshoot and fix the crashing problem in Mozilla Firefox. So we will focus on fixing the crashing problem in Mozilla Firefox Internet Browser. When we start using Mozilla Firefox in our any operating system, usually it works perfect in beginning. But with time it start showing some error, crash problems etc. and these problems are not because of its functionality, but there may have some problems in your operating system which leads it to crashing problem. So in this article we will try to give you all the possible reasons of crashing Mozilla Firefox, and that is how you will cache and Fix Mozilla Firefox Crashing. Many peoples have asked us, why does Firefox keep crashing? so that is why we have made this article to help them fix their Firefox hanging or crashing problem. We have described all the possible reasons separately of Mozilla Firefox crashing, so a user can easily find out the possible reason and fix the same. Below we have described the possible solutions of Mozilla Firefox crashing problem. Try any solution according to your problem and fix crashing of Firefox in Windows. If you are facing this problem every time you open Mozilla Firefox, then you can try to open it in safe mode and make sure if it’s crashing there also. If it still crashing in safe mode also then you can try to uninstall it from your PC and restart your PC. Now install it again and check if the problem of crashing has gone or not. If both the methods are not working for you, then try the following ways to fix it. If you are continuously facing crashing problem with your version of Mozilla Firefox, then you should check if update is available for your software or not. You can easily check for update by going to Options > Advance >Update. If your version is not updated then update it now, but if your version is updated and you still facing crashing Problem. Then check your ad-ons and make sure those all are up-to date or not. Try both the methods given above and fix crashing problem. If it is not fixed crashing problem then go further for the next step. If you still facing and want to Fix Mozilla Firefox crashing problem, then you may also check if your antivirus is upto date. If it is not update then you can update it and do a full scan of your PC. It will resolve viruses from your system, it is needed because sometimes Firefox may be affected by malware and start crashing or freezing. We will recommend you to use Norton Antivirus, because it is one of the most powerful antivirus and internet security provider. Press “Shift Button” while opening the Firefox, and it will open Firefox safe mode dialogue. Now click on the “start in safe mode” button in the dialogue box. Now your browser will start in safe mode, if your browser works perfectly in safe mode. Then is is most likely that your browser is crashing because of add-ons, theme, or hardware acceleration problem. To solve it you can troubleshoot your add-ons or themes and check whether it works or not. You can also check your RAM for error by installing “MemTest86+” or any other software. After installing it run a test for your system memory and it will detect the errors. It is needed because sometimes Firefox may crash due to RAM problems. It is the last option for you to fix Firefox, if all the above given methods doesn’t works for you then you can try it. You can use this method of Fix Mozilla Firefox Crashing, if you want to stick on this awesome browser and don’t want to use any others browser. If crashing problem is still irritates you, then you can try to update your windows and drivers. But updating your windows drivers will take hours (depending on your internet connection). You can update your windows and drivers by going to control panel > Windows Update > Check for updates. In most of the cases it Fix Mozilla Firefox Crashing, but you should try it, if all the others ways of fixing are not worked for you. Above we have told you all the possible ways to Fix Mozilla Firefox Crashing problem, these all methods are enough to fix any crashing or freezing problem in Mozilla Firefox. You can try all these methods one by one, we are guaranteeing that it will resolve Firefox’s crashing problem for sure. If you like this article, then don’t forget to share it with others and tell all your friends about these all the methods of fixing Firefox crashing. So stay connected with us for more cool tips and tricks. Enjoy all the free updates by subscribing to our news letters, or like us on Facebook to get all updates in news feeds.